The little Story Dragon Ü can only fly when a lot of children read a lot of books. Austrian primary school children therefore regularly read stories together with an adult reading partner at home, choose their favourite story and present this story in class. In class, the children wrote their own story about the adventures of the story dragon. Beautiful Story Dragons were be created and Story Dragon Festivals were held by the schools in the Reading Month April, where also the children’s reading partners were invited. 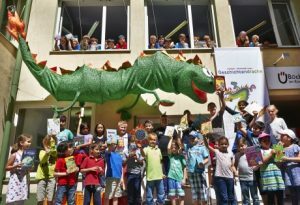 In June 2015, the best stories about the Story Dragon were chosen and awarded a prize by the Bookclub. Kids need stories – today maybe more than ever. Kids love narration and magic, because they lead to their fundamental questions: Where do I come from, who am I, and where do I go? Many parents are not used to reading or telling stories any more, and there are parents who don’t read that well or that often themselves either. Some parents just don’t know how and what to read to their kids. But children need us adults as reading partners and role models. It is not the good advice on how important reading is, nor the fear of PISA, nor the set phrase about the „good book“ that leads to reading. It’s the stories themselves. This is where the magic is that children search for. Adventures, action and fantasy in the stories make children participate. > The aim of the initiative was to strengthen reading together in families, most importantly socio-culturally challenged ones. > The participants were the adult reading partners (parents, relatives, or if necessary external tutors). They were offered reading material and were encouraged to read regularly with their children. The website http://www.geschichtendrache.at still provides audio files of stories read by famous Austrians. > The institutions and intermediaries of the project were the primary schools, reached by the network of Bookclub representatives and headmasters. The aim was to implement the Reading Partner concept sustainably in the reading culture at school. > The initiative was oriented along internationally established family literacy projects and Austrian pilot tests. The initiative was designed as low threshold, so that especially socio-culturally challenged families could be integrated without great effort or explanation. School projects that embrace children’s multicultural background, different environments and impulses from different cultures were possible and welcome. The teachers gave „The Story Dragon Scrapbook“ to each child. The children then searched for an adult reading partner and read stories together. To make the Story Dragon fly, every child read at least 7 stories together with their partner, and creatively completed the Scrapbook. From all the stories read, each child chose his or her personal favourite. Every child read or presented his or her favourite story in class. (In the first form, the teachers or the adult reading partners read the story.) These stories were recorded on a special poster. Next, the pupils wrote their story about the adventures of the Story Dragon. In the Reading Month April 2015, all participating primary schools organised Dragon Reading Festivals, where the adult reading partners were also invited. Their written stories were presented. The schools posted their stories and pictures of their Story Dragons online at http://www.geschichtendrache.at in May 2015. The best stories were awarded a prize.